Gift card holder printing allows you to make custom gift card holders that do more than just hold your cards. They allow you to surprise and delight customers while adding a touch of style to the way you present your gift cards. 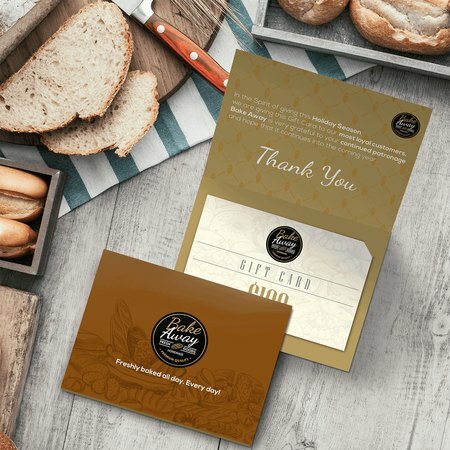 Unique gift card holders add value to your customer interactions by giving you more space for important info, and for making your gift cards even more special. Custom gift card holders are essentially miniature folders with slits for holding your gift cards by the corners. They come in 4" x 6" and fold to 4" x 3" --slightly larger than a credit card. Card holders can also be used to hold other items that are a similar size and shape as gift cards, such as coupons, membership cards, and more. Gift card holders are printed on premium 14 pt. or 16 pt. cardstock with matte, gloss, or high-gloss UV coatings. An uncoated extra-heavy 17 pt. stock is also available. Custom card holders can be printed both inside and outside, allowing you more space for artwork, branding, and information. Don’t waste time trying to figure out where to buy gift card holders. Try UPrinting’s custom gift card holder printing services today.